Offering Three Snorkel only (no SCUBA divers) Tours Daily to the shallow water bank reefs of Pennekamp Park and the National Marine Sanctuary aboard a 40ft. US Coast Guard inspected passenger vessel designed and built for snorkeling. Our morning one location tour (over 1 hour water time) departs daily at 9am and is $28.00 per person. Tour returns around 11:45. Our afternoon three location mini-cruise (over 2 hour water time) departs daily at 12:15pm and is $35 per person. This tour features the Christ statue as one of the stops. Tour returns around 5pm. Our sunset one location tour (1 hours water time) departs daily at 5:30pm and is $28.00 per person (April - September). Children 13 and under $5.00 off above prices. Prices include gear (mask, fins, snorkel and safety vest) and instruction. Group charters are available. We are located in Key Largo, Florida, home of America's first undersea Park and only living coral reef. The shallow water reefs of Pennekamp State Park and the Florida Keys National Marine Sanctuary have been protected for over 40 years making it an ideal destination for viewing Tropical reef fish close up in their own environment. All the waters of the Florida Keys are a National Marine Sanctuary. This national treasure must be protected and responsible snorkeling and diving techniques are practiced aboard KEYS DIVER. Scuba diving yes, but as more and more visitors are discovering, there is another category of diving that merits mention especially in Key Largo: Skin Diving or Snorkeling as its known today. 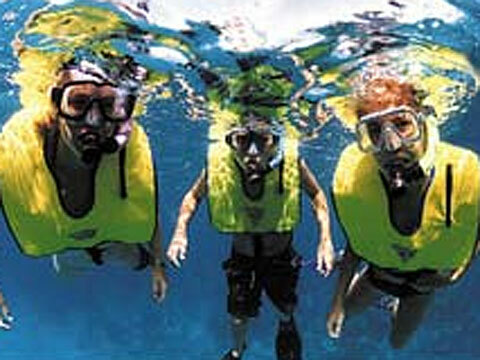 Snorkeling has become one of the most popular family sporting activities in the world today. For less than the price of tickets to Disney, Sea World or Universal the whole family can enjoy the beauty of a living coral reef. They say "If you can swim you can snorkel". With some basic instruction from a Dive Master you can be in the water observing some of the more than 500 species of tropical fish, 47 varieties of living coral and other marine creatures that help make up the underwater world of John Pennekamp State Park and the Key Largo National Marine Sanctuary. A large shallow water bank reef occupies a portion of this park and makes it one of the world's premier snorkeling destinations. All of the many Scuba Diving shops located on Key Largo do offer snorkeling on their boats but the tours are scuba diving trips and as such are geared for the certified scuba diver and are usually done on the deeper reefs and wrecks of the park. At Keys Diver we offer snorkel only tours and these trips are geared for the skin divers, from the novice snorkeler to the experienced scuba diver. On these tours you may find parents who have been scuba diving for years introducing their young children to the wonders of the sea. In the process they re-discover what got them interested in diving in the first place. The thrill and freedom of floating over a living coral garden with only mask, fins and snorkel and safety vest is hard to top. So if you have never come face to face with a queen angelfish or you just want to relax on the surface for a day before flying home, take a snorkel tour with Keys Diver and you will say "The Best Family Fun in Florida."